This was first published as an AFSC Blog on May 23 2018 in conjunction with the third “week of action” of the Poor People’s Campaign. Dr. King’s moral equation, spoken at the time the U.S. was raining bombs and napalm on the people of Vietnam, still applies today. We also know that aerial bombardment equals civilian deaths, mostly for women and children. Consumption of fossil fuel by naval vessels and military aircraft equals tons of carbon injected into the atmosphere. War equals ecological devastation. And extreme violence equals lasting trauma for both the perpetrators and the surviving victims. But there’s another equation, impossible to avoid in hundreds of communities spread across the country, which says military spending equals jobs. For a case in point, I need look no farther than Nashua, New Hampshire, home of BAE Systems, which with 5400 employees is by far the largest industrial employer in the state. Not only does BAE employ more than three times as many workers as the number two, but it matches charitable donations from employees and provides grants in the areas of education, including sponsoring the First Lego League and a Women in Technology program. It states that it is “committed to working to high ethical, safety and environmental standards, retaining and attracting a diverse and talented workforce and making a positive contribution to the countries and communities in which we operate.” A BAE representative sits on the board of the United Way of Greater Nashua. In other words, BAE presents itself as a good corporate citizen with a $982 million annual impact on the New Hampshire economy. BAE’s largesse, like the wages it pays to its workers, is a product of the war economy, more specifically the sale of electronic components for missiles, bombs, aircraft, and other military technology to the Pentagon and other weapons makers. BAE, a subsidiary of the firm formerly known as British Aerospace, is currently the third largest military contractor in the U.S., with more than $23.6 billion in Pentagon sales, an amount which makes up 91% of its total revenue, according to Defense News. It spent nearly $4 million on lobbying last year, according to the Center for Responsive Politics, and $1.2 million on political candidates in the 2016 campaign cycle. While the jobs it creates are real, the military spending equals jobs equation doesn’t hold up when we ask what would happen if the funds were spent elsewhere. According to Heidi Garrett-Peltier, a UMASS economist, “over the past 16 years, by spending money on war rather than in these other areas of the domestic economy, the US lost the opportunity to create between one million and three million additional jobs.” The reason: Government spending in any other area is a better job creator. We might say that the equations which joins military spending to jobs can be disproved. But that is not just a mathematical process, it’s a moral and political one. That’s the point of the Poor People’s Campaign, to recast our nation’s politics in a moral framework. Fifty years after the first Poor People’s Campaign it is well past time to tend to our spiritual health by changing our nation’s priorities. We don’t have as much to lose as we might fear, and we have a lot of ground – moral and economic – to gain. Projections for slow growth in US government spending on military weapons are sending firms looking across the border for new markets. And our government is ready to help them peddle “aerospace and defense” products all over the globe. It’s not just the federal government getting behind the global arms trade. What Dwight Eisenhower called the “military industrial complex” reaches into state economic development offices, at least in New Hampshire. 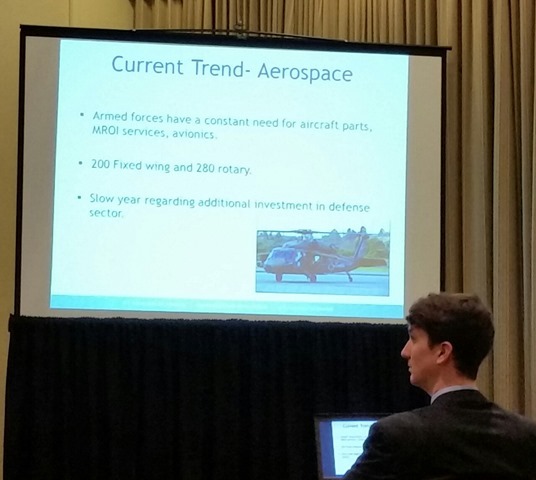 That’s one of my takeaways from the second annual New Hampshire Aerospace and Defense Conference, which drew about 200 people to the Radisson in Manchester on June 1. Perhaps I should not be surprised. After all, the state’s largest industrial employer is BAE, a British firm that was the Pentagon’s third largest contractor last year. 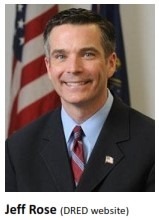 And the state’s Department of Resources and Economic Development (DRED) is headed by Jeff Rose, who worked as director of public affairs for BAE Electronic Systems prior to entering state service and who served as one of the conference’s opening speakers. 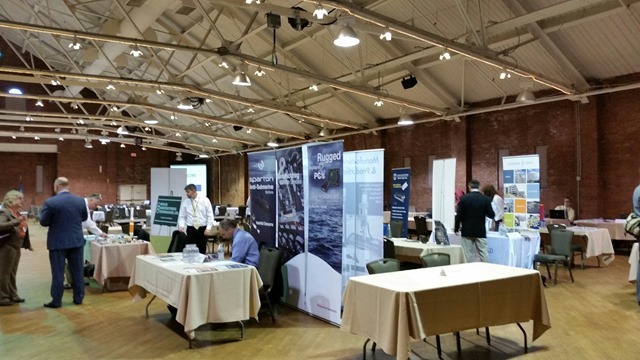 Rose’s department, through the Division of Economic Development, hosted the conference in partnership with the NH Manufacturing Extension Partnership, a private group that happens to be housed at the DRED office on Pembroke Road in Concord. It’s a “competitive mandate that you’ve got to export,” Hyatt advised. New Hampshire’s Congressional delegation stands at the ready to help. 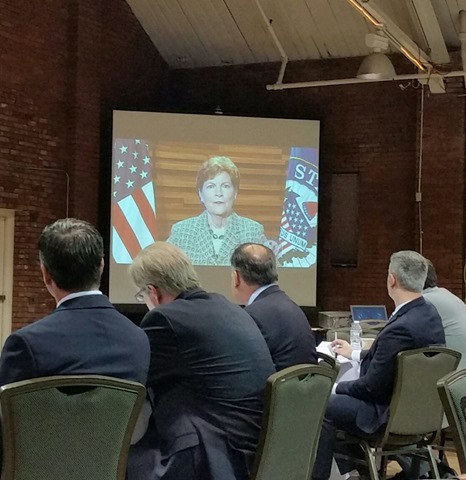 “You have to gain access to new markets around the world,” Senator Jeanne Shaheen said via a video shown at the opening session. “Don’t hesitate to reach out to me,” she stressed. 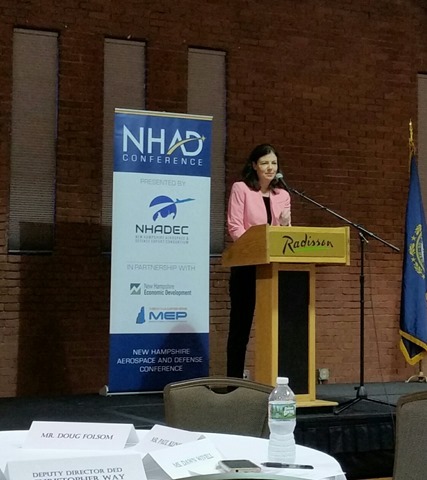 “I will do everything I can to make sure New Hampshire’s aerospace and defense industry continues to be successful … in the global marketplace,” pledged Congresswoman Ann McLane Kuster, also via video. Senator Kelly Ayotte, who was there in person, said she was working on making it “easier and more efficient” to sell products overseas, a top level demand of arms traders held back by government regulations that require them to jump through various hoops before their products can reach foreign markets. “If there is anything you need from us, do not hesitate to reach out,” Congressman Frank Guinta offered. “Opportunities for Aerospace and Defense Products, Technologies and Services in the International Marketplace” was the conference theme. The opportunities are abundant, explained Diane Janeway, who spent 30 years at Northrup Grumman and now works on market forecasts at Jane’s IHS. “Global defense spending will increase as perceived threats to stability grow in Asia, Europe, and the Middle East,” she projected. Granted, the industry is not all about armaments. But little distinction was made by conference speakers. “There’s a lot of helicopters,” he said, pointing out that the billions of dollars in US aid to the Colombian government to fight the FARC insurgents was “a big plus for you guys.” Not only that, but “all these aircraft are being shot at on a daily basis, so there’s a lot of parts needed,” Gonzalez explained. War means market opportunities. For BAE, Jeff Rose’s former employer, nearly 93% of its revenue came from the military sector in 2015. Kennedy, an official with the US Department of Commerce, about a recent decision by the Obama administration to cut off sales of cluster bombs to Saudi Arabia. “It’s the first concrete step the United States has taken to demonstrate its unease with the Saudi bombing campaign that human rights activists say has killed and injured hundreds of Yemeni civilians, many of them children,” Foreign Policy reported on May 27. The decision will have a significant impact on Textron, which has sold millions of dollars’ worth of cluster bombs to the Saudi government. Do staff in Kennedy’s office at the International Trade Administration advise US businesses to watch the human records of countries where they are considering doing business? Nope. Human rights “is a State Department angle,” Kennedy responded. A lunchtime conversation with a manager of a Connecticut firm which services machine shops in the aerospace industry was revealing. He’d love to get contracts with firms that build components for the superconducting supercollider, he said. But he’ll take contracts working on components of cluster bombs or nuclear triggers if that’s where the business is. Who Profits from the Refugee Crisis? This was first published yesterday by TruthOut, reprinted by permission. For more perspective on the undue influence of the military industrial complex, visit Governing Under the Influence. Wars and persecution have driven the number of refugees to record-breaking highs worldwide, the Office of the UN High Commissioner for Refugees reported in June 2015. Currently 59.5 million people – nearly 1 percent of the world’s population – are refugees, asylum seekers or internally displaced. Half of them are children. This crisis has everyone talking about the proper response, but very few are talking about who is profiting from this tragic situation. The reality is that wars, including the ongoing conflicts in the Middle East, fuel migration and extremism. Wars also fuel arms industry profits, which boost the industry’s capacity to influence public policy and generate more sales. For example, the US Air Force has already fired so many (more than 20,000) missiles and bombs at ISIS positions that it is on the verge of running out, USA Today reported on December 3, 2015. That has to be good news for Lockheed Martin, which makes the Hellfire missile. Military-industrial-complex executives have assured the titans of global finance that more war means more markets for their products. Lockheed Martin chief financial officer Bruce Tanner told a Credit Suisse conference that war in the Middle East would give his firm “an intangible lift,” and enhanced demand for F-22s and the new F-35 jets. At the same meeting, The Intercept reported, Oshkosh president Wilson Jones asserted his confidence that a growing ISIS threat will create more demand for the company’s armored vehicles. It is no coincidence that stock values in such companies as Raytheon, General Dynamics, Booz Allen, Lockheed Martin and Northrop Grumman all rose steeply the day after the Paris attacks, according to The Intercept’s analysis. International arms sales are trending upward, with the United States holding onto its position as the world leader. “The volume of transfers of major weapons in 2010-14 was 16 percent higher than in 2005-2009,” reports the Stockholm International Peace Research Institute. For the United States, arms sales were up 23 percent. “More than any other supplier, the USA delivered major weapons to at least 94 recipients in 2010-14,” SIPRI’s research found. The arms were spread throughout the world, but the Middle East received one-third of US weapons exports. Conflict Armament Research, a London-based group which analyzed the ISIS arsenal, found that “the Islamic State’s relatively newly-formed force has had little difficulty tapping into the huge pool of armaments fueling the conflicts in Iraq and Syria, supplied not only by the world’s big powers but also by up-and-coming exporters such as Sudan,” according to a summary from the Center for Public Integrity. One of the ammunition suppliers is a factory in Lake City, Missouri, run by Alliant Techsystems, which spent $1.35 million on lobbyists in 2014. The cycle goes on. The military-industrial complex uses its lobbying clout and PAC contributions to win contracts for weapons production. Weapons used overseas drive people from their homes and create more enemies. Enemies capture weapons and turn them against US targets. Desperate migrants seeking safety provoke heightened waves of xenophobia, leading to more violence at home, especially against immigrants. More fear and more violence create more markets for weapons makers. More sales provide more funds to spend on lobbyists, election campaigns and pro-war think tanks. “Only an alert and knowledgeable citizenry can compel the proper meshing of the huge industrial and military machinery of defense with our peaceful methods and goals, so that security and liberty may prosper together,” Eisenhower emphasized. It is long past time to answer his plea.